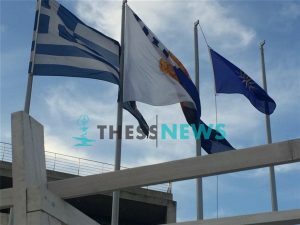 Employees at the Thessaloniki municipality were surprised to find that flag of the EU, one of three at the town hall’s main entrance, had been replaced with a flag depicting the Sun of Vergina, an ancient Greek symbol used over many centuries which gradually became associated with Macedonia. There are three flags adorning the building, the Greek flag, a float of the municipality and a European Union flag. The perpetrators have not been identified so far by authorities. unknown changed the flags in the evening so that in the morning, with the first light of the day, the new flag waves. A similar incident has been reported in the past.